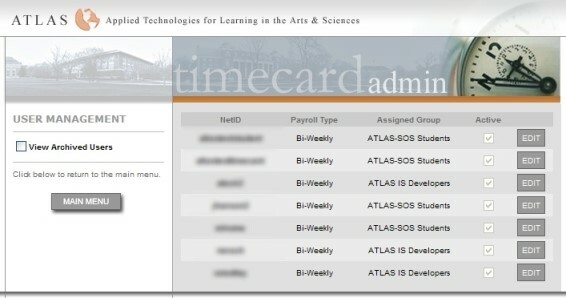 Detailed below are the instructions on how to do various features as a group manager in the ATLAS TimeCard app. These instructions are for users with group manager access to the app. If you have been granted manager access and it seems like options are missing or that the app isn’t working, it may be a technical issue. Email ATLAS at atlas-apps@illinois.edu for additional support if the guidelines below don’t answer your question(s). Group managers will be directed to a menu to select one of three pages available to them: View TimeCard Entries, TimeCard Report, and User Management. The View TimeCard Entries page allows managers to view the TimeCard entries for employees within the groups they manage. Filter employees through different criteria by using the left sidebar. It is critical for TimeCard entries to be approved so the information can be forwarded to payroll. Locate the NetID of the approved employee. Find the corresponding checkbox on the far left-hand column. Select the checkbox (there should now be a checkmark in the box). 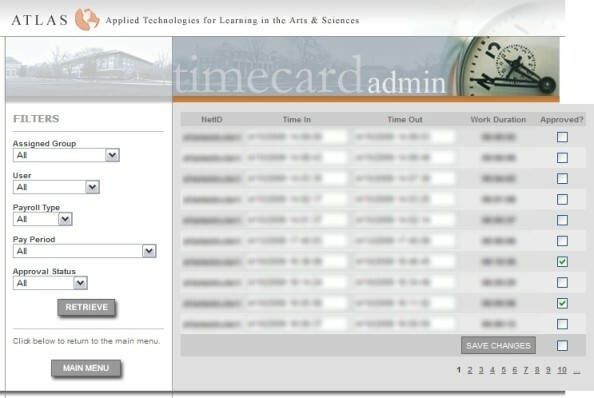 Click the Main Menu button to return to the main TimeCard page. View a summary of all employees' TimeCard entries for a given pay period. 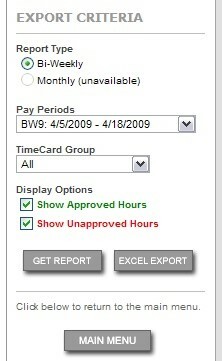 View multiple pay periods along with specific groups. Export reports to Microsoft Excel. The User Management page allows the ability to set the Active status of employees, move employees between any groups within the system, and change payroll types. To the right of this text there should be a dropdown box. Click it, and then change the number of results per page. This should speed up your search. You can then change pages by clicking Next > or Last >>. You can also select the dropdown box located next to Page: and jump to a certain page. After you have located the user you wish to change, click the Edit box located on the right most portion of the table. You can now alter their ‘Payroll Type’ by clicking the drop-down box under that heading and selecting either Bi-Weekly or Monthly. You can also alter their ‘Assigned Group’ by clicking the drop-down box under that heading and selecting the desired group. After your changes have been finalized, click the Save button.